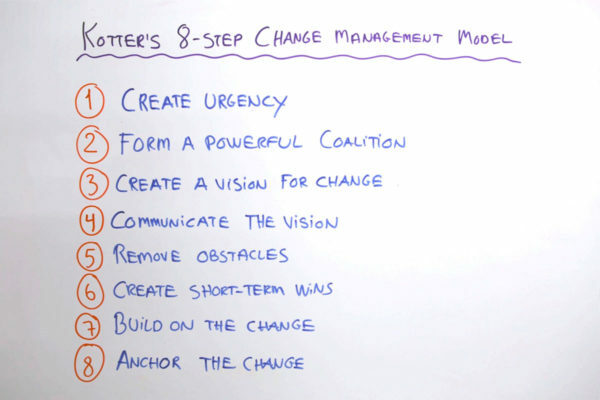 Leadership coach Susanne Madsen channels change management guru John Kotter to offer an 8 step method for effective change in your organization. It takes work, but anything of value does, and if you’re sure the change is needed then you’re invested and have the tools to see it through. Pro-Tip: Each of the steps that Kotter outlines in his process are important, but none may be as crucial as the first one. He notes that for change to happen at least 75% of the company’s management has to be on board, so take time and effort to build the urgency necessary to get others to buy-in to your change. Hi. I’m Susanne Madsen. Welcome to this whiteboard session on Kotter’s Eight Step Change Management Process. Kotter, or John Kotter, is one of the biggest change management gurus out there. He has come up with an eight-step model that can help us to embed change effectively in an organization. Let’s look at each step. The first one is to create urgency. What he’s saying is that managers and leaders must create a compelling case for change. They must make people understand why the change is necessary and they must inspire people to move from the current state to a future state. Secondly, he talks about forming a powerful coalition. With big change management programs it is not enough that you as a project manager or change manager does all the work and does all the communication. You need a team, a coalition of people who can help you do that. You need to identify key people within the organization who can act as change leaders or change champions to help embed it into the organization. Thirdly, he talks about creating a vision for change. The vision must be short, clear, understandable and preferably have an emotional element to it and a creative element because we want the vision to be easily understood by the people who are affected by the change. Change can be emotional, hence, we want to communicate in that way. We want the vision to be relevant to the people who hear it. Next, we need to communicate the vision. Of course, it’s not enough to have a vision if we are not using it. That means that you must embed the vision into everything you do on your project be it written communication or verbal communication. Even more than that, you must showcase the vision. Walk the talk. Demonstrate the vision. Be the change you want to see. The next step is to remove obstacles. As you get into the thick of change, into really the body of the work, you will find that there may be physical obstacles or emotional obstacles. This is where the change team needs to step in and help people overcome those obstacles. They must listen to people’s fears or concerns and seek feedback. Create feedback loops so that we can understand what is working well, what is not working so well, how can we improve and overcome the obstacles. The sixth step in Kotter’s model is to create short term wins. There is nothing as powerful when you implement change than demonstrating the benefits early on. Don’t take two years to create a program and only deliver benefits then. Chunk your change project up into sizable pieces, for instance, different phases. At the end of each phase, you demonstrate tangible benefits. We also talk about it as low hanging fruit or quick wins. You want to win people over early on by demonstrating what’s in it for them. The seventh step is to build on the change. Don’t let up too soon. You need to keep repeating the above steps for quite a while for it to be embedded. That means that you must keep communicating the vision, removing obstacles, and keep delivering benefits. Lastly, anchor the change. You must make sure that the change sticks. That means that you must embed it into organizational procedures, operating models and into people’s day to day work.